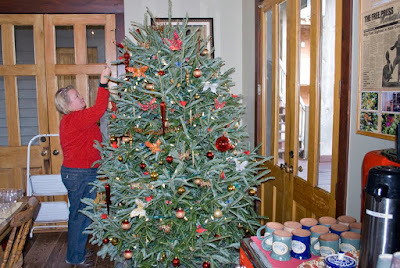 Here you can see Mary Ann decorating our newly arrived Christmas tree. December is a great time to visit the Inn Above Onion Creek. Our rooms are a fantastic retreat from the cold and great place to relax from the daily grind. After arrival settle in to your room where a toasty fire can warm you up as you enjoy the beautiful hill country views. Grab a movie from the library and hop into one of our feather beds and just relax until 6pm when you can head down to the dining room for a tasty 3 course dinner. After dinner retire to the room where a whirlpool bath will get you ready for a wonderful night sleep. Sound relaxing? Give us a call for a last minute escape to the Inn Above Onion Creek. Inn Above Onion Creek "Artists"